Levantines are people of European descent who settled along the Aegean and the Mediterranean coasts of the Ottoman Empire. Izmir became the Empire's most cosmopolitan city, with English, French, Italian, Greek, Jewish, Armenian, Austrian and Turkish communities. Levantines, who settled in Izmir in the 18th and 19th centuries, were mostly from the upper and educated classes in Europe. Minorities from different nationalities and religions could intermarry, and many did - a practice which was mostly not possible in Europe at that time. 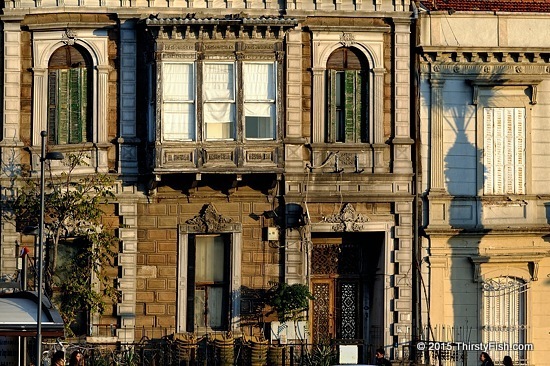 Today, there is an effort to restore and open to tourism some of the Levantine mansions in Izmir. Some of the surviving Levantine houses, like the Kordon houses in the photo, are badly in need of restoration; That is, if they do not get converted to high rise modern buildings.